(Click the image to view full size) Turn your device into an Augmented Reality Ghost Hunting Kit with the Spotted: Ghosts ARK! With an integrated EMF Meter and Spirit Box, on screen, you can fully optimise this kit for virtually any investigation. 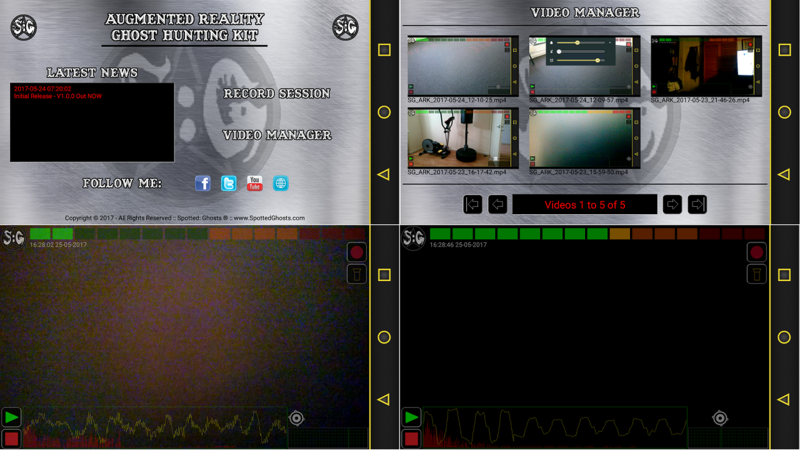 This app records the content on your device screen, so that we can overlay the EMF Meter and Spirit Box into the video. You can also stream your paranormal investigation / ghost hunt via the YouTube Gaming app, which is available for FREE. The EMF Detector uses the Magnetometer built into your Android Device (some devices do not have this, in which case the feature will not work). This is a new Spirit Box, using a Soundbank of over 3000 BRAND NEW sound clips, taken from AM FM CB CW VHF UHF, Morse, various ghost box recordings & phonetic audio from single words in many different languages (Some even overlayed & echo'd) & a few other sources. The Video Recorder allows you to record your ghost hunt / paranormal investigation. A folder is created on your device called "SpottedGhosts", in there you will find folders for all of our apps. Go into the "SG_ARK" folder, then into the "Videos" folder, here you will find all your recordings as mp4's. A handy tool to have for any Paranormal Investigations or Ghost Hunting Session! Please be aware, I am not stating that ghosts / spirits will 100% communicate with you through my app, but it has worked for me and many other people. Please be patient, I hope you get the answers you are looking for.